Gartner is an information technology research and advisory company. 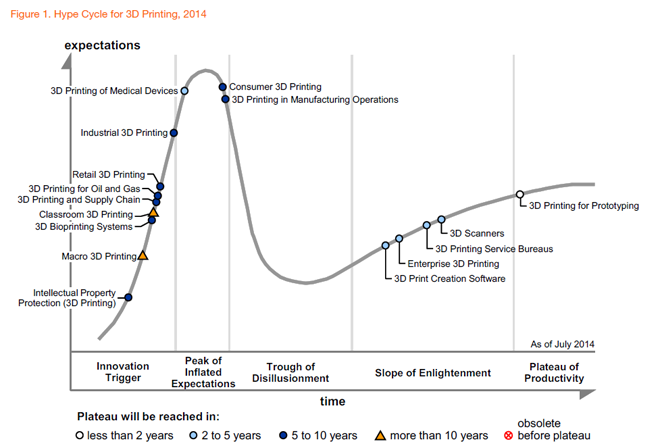 The image below is their research from 2014 on the 3D printing industry. The full report can be found here. CLIP (Continuous Liquid Interface Production) is a new 3D printing technology from Carbon3D that “grows” parts instead of printing them layer by layer like traditional material extrusion printers. CLIP is a chemical process that balances light and oxygen to eliminate the mechanical steps and layering of FDM printers. It works by projecting light through an oxygen-permeable window into a reservoir of UV curable resin. The build platform lifts continuously as the object is grown. Light makes the resin solid, oxygen keeps it from becoming solid. What is an SLA 3D printer? Stereolithography was the first 3D printing process. Instead of melting plastic through an extruder like many popular 3D printers, it uses a laser beam to build a solid 3D object within a small tank (or vat) of liquid photopolymer. A photopolymer is a liquid material that changes to a strong, plastic-like solid almost instantly when light of the right color shines on it. The first stereolithographic 3D printer manufacturer, 3D Systems, called the printers “StereoLithographic Apparatus,” or SLA. So the 3D printers you see advertised as SLA printers all use some version of stereolithography. They use a laser to build an object layer by layer on the surface of a liquid polymer. As the build platform is lowered, each layer cures (becomes solid), and the next layer is built on top. Objects printed with SLA printers are very accurate and have a smoother surface than most objects created by material extrusion. SLA objects need to be washed with a solvent, and then rinsed with water to clean the object after printing. A wide range of photopolymers are available to develop printed objects.They can have a rubber-like plastic finish, or be made with totally clear resins, flame retardant plastics or special materials for applications such as dental modeling and jewelry design.